It's been sunny again in Utrecht for the past few days. Really sunny. I personally can't wait for Spring to arrive. To bridge the cloudy weeks to come, here's a session Buck Meek recorded in my backyard last year. This American songwriter has very quickly become one of my favourite musicians - both his solo and Big Thief records are on the top of the rotation over here. Last year he came straight from the airport to Utrecht and recorded his song Fool Me, plus covers of Duff Thompson and Townes van Zandt. 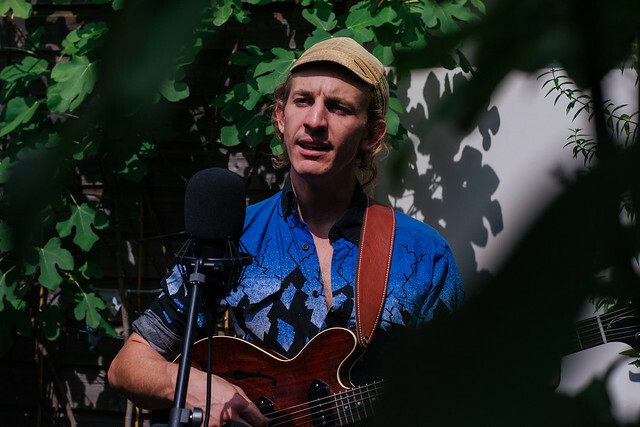 Just yesterday, Buck Meek's band Big Thief released the stunning new song UFOF, following last week's solo release Halo Light - 'a gently rumbling rumination on the afterglow of loss, humanity’s ephemera, and the eternal nature of love'. Busy times for Meek who's about to join Wilco's Jeff Tweedy on tour, having just finished one with Twain. There's something about Buck Meek's self-titled solo LP - released via Austin-label Keeled Scales in May 2018 - that soothes your soul and ignites your brain. Starting with the artwork, a photo of a fox and a rainbow. It looks like the capture of a lifetime, one that will have made its photographer glow for a good while. Meek's record and its gentle sound cause a similar effect. Come to think of it, it reminds me a lot of what I love about Wilco. The last time someone recorded an a capella cover for The Influences, was Hiss Golden Messenger, years ago. When Meek started singing Townes van Zandt's Two Girls, I was so blown away, I almost had to remind myself I was filming. Can you feel it? I can feel it too. All too many times we're running through the paces, taking life for granted or simply too busy to enjoy any of it really. I spend quite a bit of time on trains these days and have been using Buck Meek's and Big Thief's music as a way to slow down and take a breath. To look out of the window and take it in. I have enjoyed some brilliant views on skies, houses, fields and animals, and I have Buck to thank for making me see them. Here's a free tip for you if you like Buck Meek and Big Thief, look up the records that Meek and Big Thief's Adrianne Lenker made together, as well as Muck's 2015 EP Heart Was Beat which features Lenker and Twain's Mat Davidson among others. He's good, isn't he? Go see him live and find out all Buck Meek's upcoming tour dates, right here.